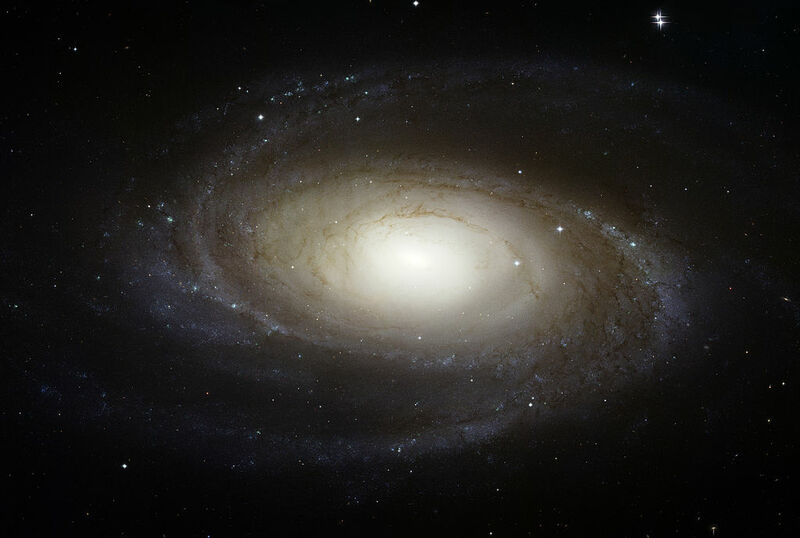 Messier 81 (M81), also known as Bode’s Galaxy, is a grand design spiral galaxy located in the constellation Ursa Major. The galaxy lies at an approximate distance of 11.8 million light years from Earth and has an apparent magnitude of 6.94. It has the designation NGC 3031 in the New General Catalogue. Messier 81 occupies an area of 26.9 by 14.1 arc minutes of apparent sky, which corresponds to a linear diameter of about 90,000 light years. 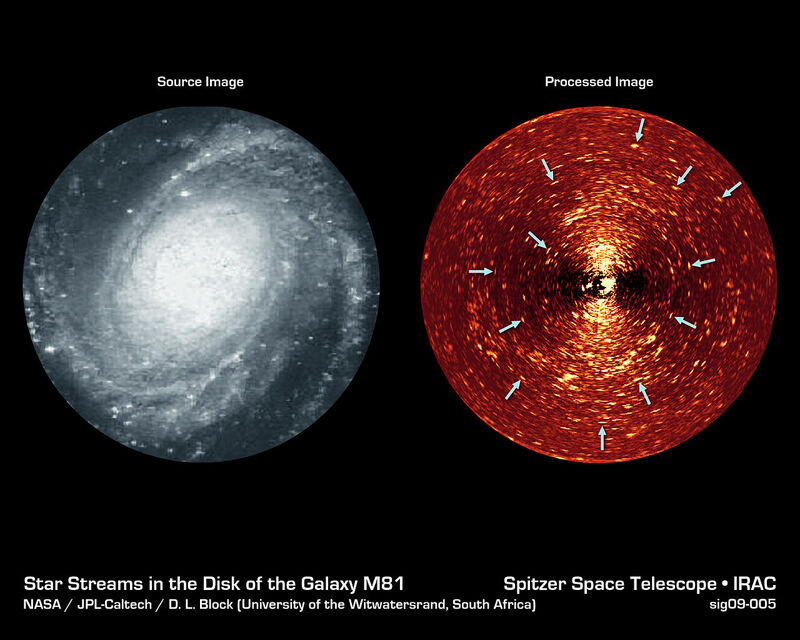 It can easily be seen in binoculars, which only show a dim patch of light, and is best viewed in larger telescopes, which reveal details of the galaxy’s spiral structure. 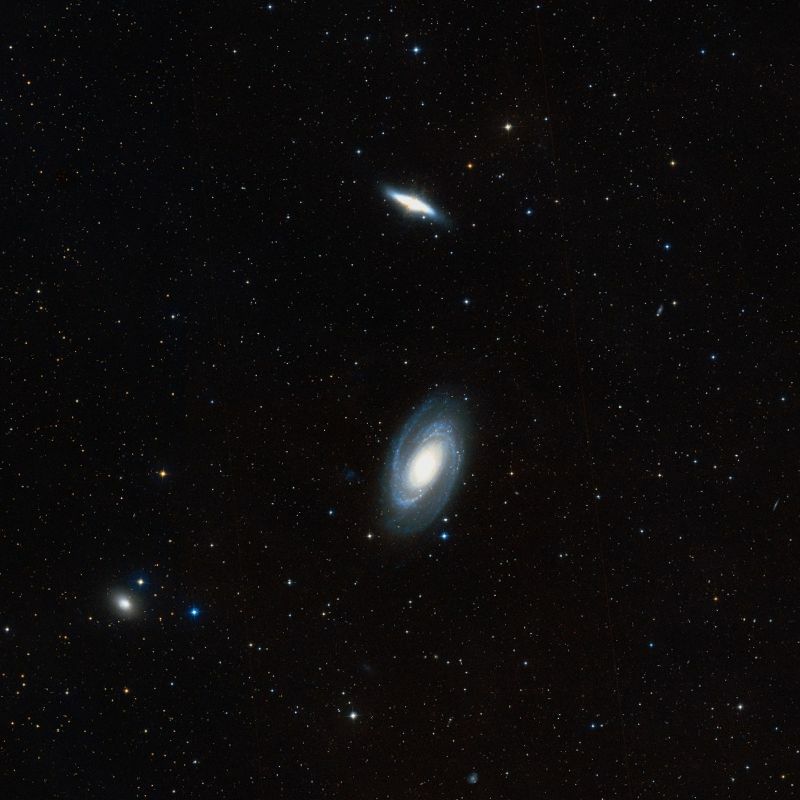 3-inch telescopes show M81 as a hazy, bright oval-shaped patch of light, while 6-inch telescopes reveal the galaxy’s bright core surrounded by a faint halo. Bode’s Galaxy can be found about 10 degrees northwest of Dubhe, Alpha Ursae Majoris. 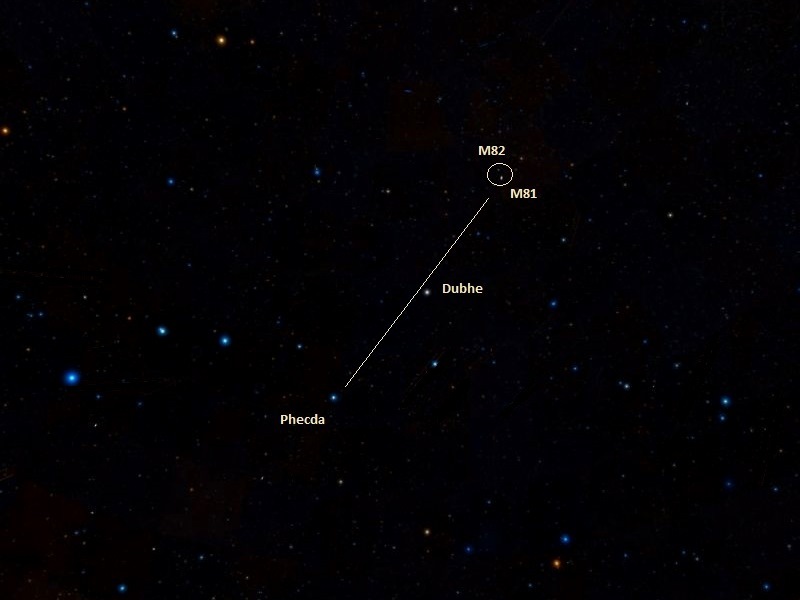 An imaginary line drawn from Phecda, Gamma Ursae Majoris to Dubhe and extended by roughly the same distance as that between the stars leads to M81. The best time of year to observe M81 is during the spring. 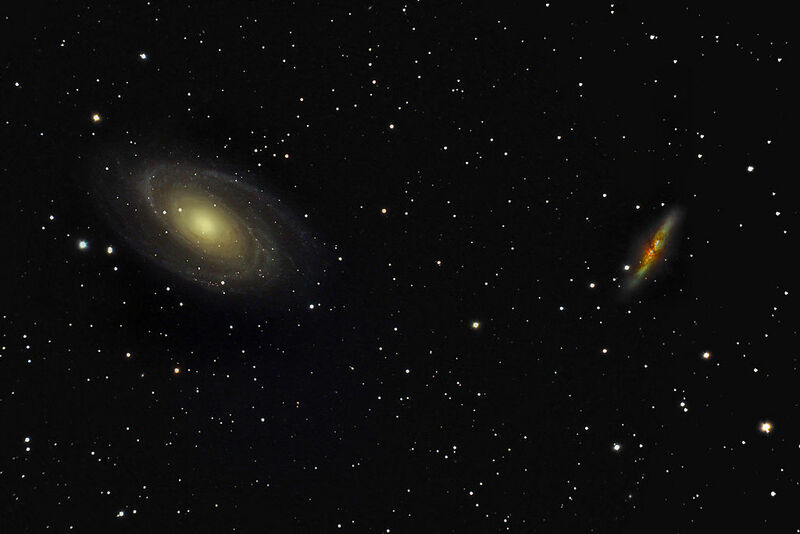 Several other members of the M81 Group, including the Cigar Galaxy (M82), are located in the same region of the sky. 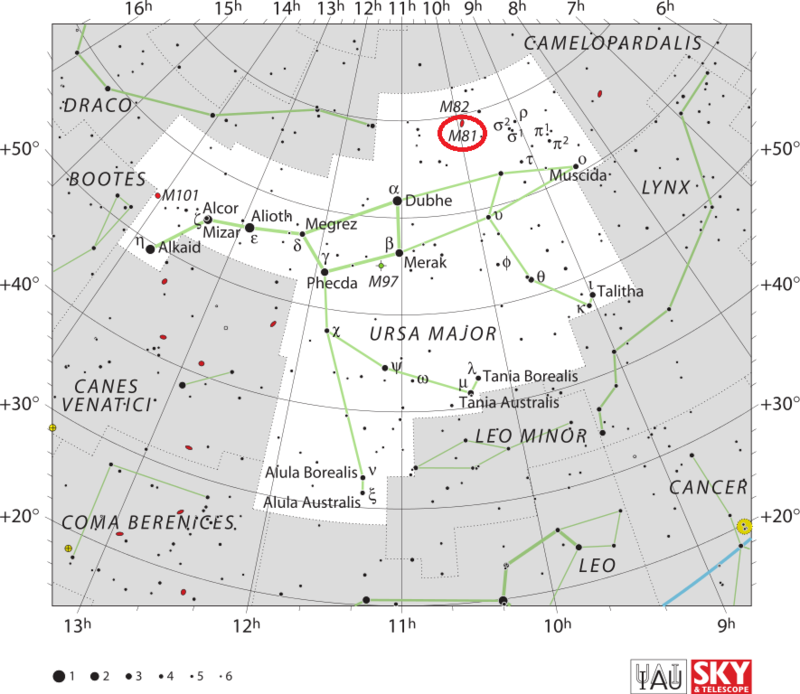 The Cigar Galaxy can be seen 38 arc minutes north of M81. The two galaxies can easily be seen in binoculars and small telescopes, but are not visible to the naked eye. M82 is smaller and fainter than M81, but is a wonderful example of a starburst galaxy and the two make a popular pair among astronomers. 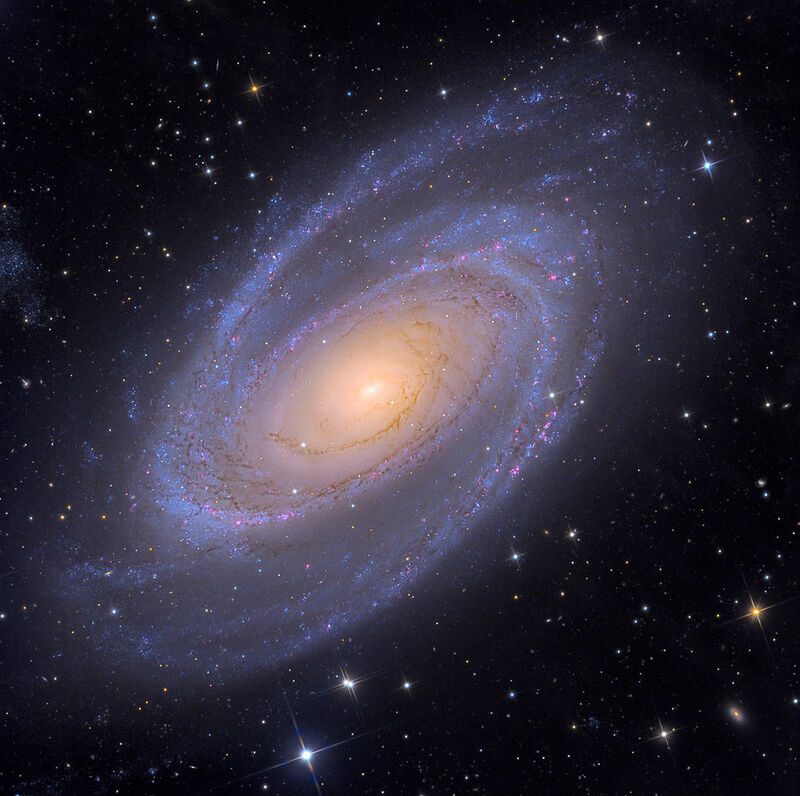 8-inch and larger telescopes are required to make out the spiral structure in M81. The galaxy can be seen from northern latitudes, but is invisible to southern observers, except for those living near the equator. With prominent, clearly defined spiral arms, Bode’s Galaxy is an excellent example of a grand design spiral. 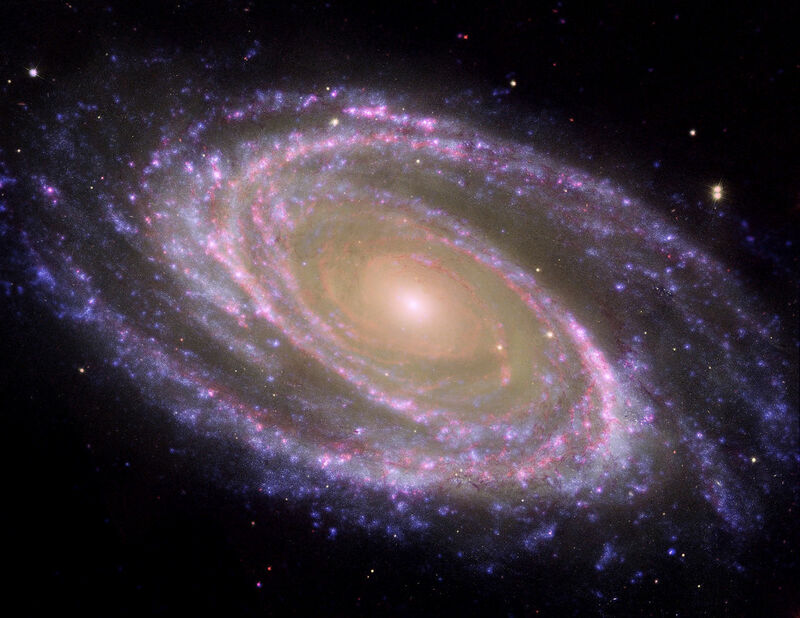 The galaxy’s size and proximity – it is one of the nearest galaxies beyond the Local Group – often make it a target of study by professional astronomers, while amateur astronomers and astrophotographers like to observe the galaxy because it is large and has a relatively high brightness. Bode’s Galaxy is home to over 250 billion stars. It is the most remote blueshifted (moving toward us) large galaxy known. Messier 81 has two well resolved spiral arms that contain large quantities of interstellar dust, associated with numerous starburst regions. 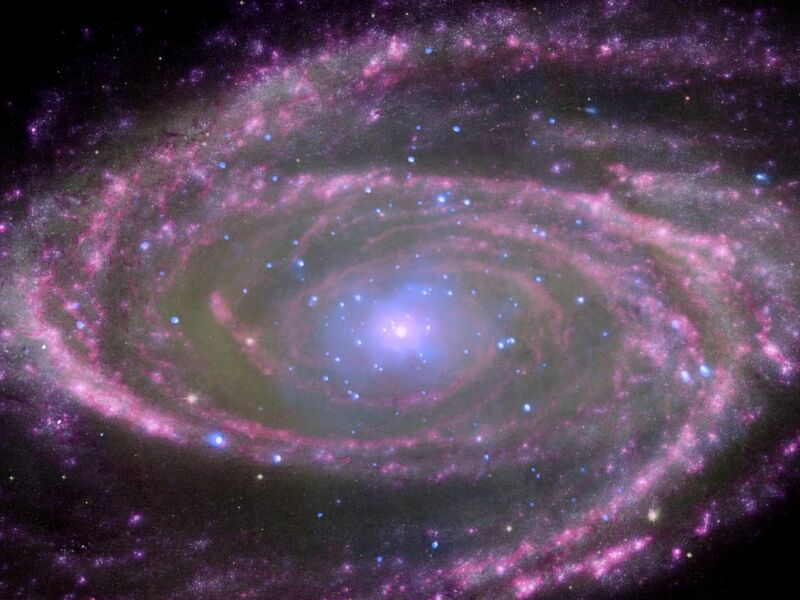 Images of M81 taken at infrared wavelengths by the Spitzer Space Telescope have revealed that the interstellar dust is responsible for most of the infrared emissions detected in the galaxy. The hot, young, blue stars in the star forming regions of M81 heat the dust, increasing the emissions from these regions. This beautiful galaxy is tilted at an oblique angle on to our line of sight, giving a “birds-eye view” of the spiral structure. The galaxy is similar to our Milky Way, but our favorable view provides a better picture of the typical architecture of spiral galaxies. M81 may be undergoing a surge of star formation along the spiral arms due to a close encounter it may have had with its nearby spiral galaxy NGC 3077 and a nearby starburst galaxy (M82) about 300 million years ago. M81 is one of the brightest galaxies that can be seen from the Earth. It is high in the northern sky in the circumpolar constellation Ursa Major, the Great Bear. At an apparent magnitude of 6.8 it is just at the limit of naked-eye visibility. The galaxy’s angular size is about the same as that of the Full Moon. Messier 81 is the largest member of the M81 Group of galaxies, a group that contains 34 galaxies located in Ursa Major. The M81 Group includes the Cigar Galaxy (Messier 82) and NGC 3077, two galaxies that are strongly affected by their large neighbour. The gravitational influence of M81 has left all three galaxies stripped of hydrogen gas. The interactions between the galaxies have allowed interstellar gas to fall into the central regions of Bode’s Galaxy and NGC 3077, which has triggered vigorous starburst activity there. Bode’s Galaxy has 70 globular cluster candidates, detected in 1995, and an estimated total number of about 210 globulars. A distance of 11 million light years was determined in 1993 using the Hubble observations of 32 Cepheid variables in the galaxy. The distance was later corrected using data from ESA’s Hipparcos satellite. A supernova was observed in Bode’s Galaxy in 1993. Named SN 1993J, the supernova was first detected by the Spanish amateur astronomer Francisco Garcia Diaz on March 28 of that year. Reaching a maximum brightness of 10.5, it was the second brightest supernova event seen in the 20th century at the time of discovery. SN 1993J was classified as a type IIb supernova, a transitory class between type II supernovae, caused by explosions of giant stars, and type Ib supernovae, triggered by the core collapse of massive stars. Observations of SN 1993J have indicated that types Ib and Ic were triggered by explosions of giant stars through processes similar to those seen in type II supernovae. A nebula near the ear of the great Bear, on the parallel of the star d, of fourth or fifth magnitude: its position was determined from that star. This nebula is a little oval, the center clear, & one can see it well in an ordinary telescope of 3.5 feet [FL]. It was discovered by M. Bode at Berlin on December 31, 1774, & by M. Méchain, in the month August 1779. This 22-second animation uses an “infrared spotlight” to highlight differences between a visible-light image of Messier 81 and the Spitzer/MIPS+IRAC infrared view.